Boardman’s Elite range separates into two families: the anorexic SLRs and the wind-cheating AiRs. The AiR/9.4 sits in the middle of the latter and at first glance looks very much the traditional aero bike with aerofoil-shaped tubing, sitting tall and thin. A narrow front profile augmented with internal cable routing enhances the traits. Despite these ‘normal’ looks, there are a few pertinent details that may go unnoticed and warrant further scrutiny. Contrasting in colour, the internal faces of the fork legs and rear stays are flattened to allow air to flow over them uninterrupted as it comes turbulently off the spinning wheels. Many of the other details combine to resist the flaws that can afflict some aero bikes, namely a flexy, disconnected ride. The BB30 bottom bracket uses an oversized axle, requiring a larger-diameter tube for the bearings. This enhanced portion of the frame allows for larger diameter tubing to be used elsewhere, further resisting the torque applied at the pedals and bars. A traditional weak point is the joining of the smaller chainstays to this solid area. Rather than going down this route, Boardman’s designers manufacture the bottom bracket and chainstays as one piece, preferring to have the join in the down tube, where the oversized tubing offers more material to combat pedalling forces. In a similar vein, the chainstays are a more constant size in their boxy taper, stepping down with a defined angular box structure at the rear dropout. In testing they claim this better resists the loads than having a regular reduction in scale along their length. In the front triangle, the frame needs to resist twisting forces during cornering and explosive efforts. To that end, a tapered fork steerer and head tube are employed. 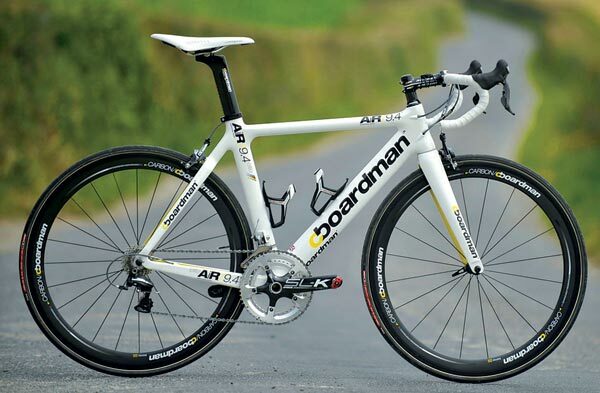 Boardman has quickly gained a reputation for exceptional specification at a given price point and the AiR/9.4 excels in this department. Other than the BB30-specific FSA SLK carbon chainset, the Boardman has the same Dura-Ace groupset as the Scott Foil R1 – which is almost twice the cost. Ritchey WCS finishing kit is used on both bikes, albeit in aluminium here rather than the carbon fitted to the Scott. On the road, the cheaper parts actually outperform the carbon, the stem being substantially stiffer. Own-brand, carbon-rimmed tubular wheels are an unknown quantity when it comes to longevity, but the Vittoria Corsa CX tubulars are among the best around for feel and grip. Just make sure you get them glued on well – ours were a little lacking in that regard! In terms of performance, the wheels were as stiff as the – slightly deeper – Reynolds Strikes fitted to the Litespeed. That’s to say adequate but not outstanding.